To really understand paddles you need to experiment a lot with different variables; different lengths, degrees of blade stiffness, blade widths areas and shapes, and also paddling styles. The more you understand, the easier it will be for you to choose a paddle and paddling style that suits what you want to do, and the better you'll be able to use your paddle. 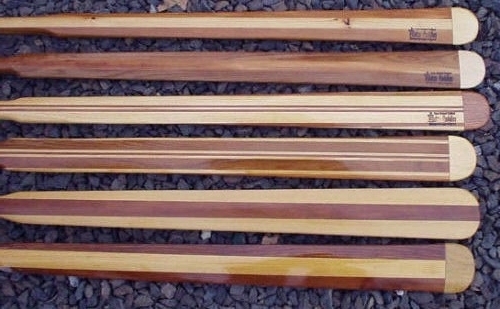 Try a different type of paddle from the one you usually use. 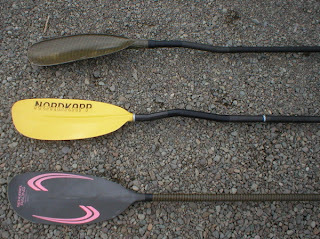 Borrow a wing for a while, or a Greenland paddle, or a general touring paddle, whichever is the least familiar to you. 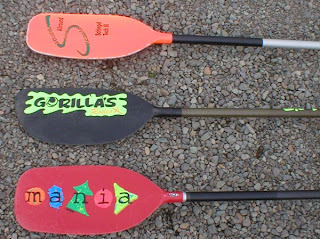 If you have an "high angle" paddle style, experiment with a paddle designed for a "low angle" of presentation. Compare the effectiveness of your usual stroke with the effectiveness of a "low angle" stroke. Learn more about the effect of "swing weight" by attaching a weight to each of your paddle blades. (use elastic bands to hold a small zip-lock bag of water to each blade) You should notice a big difference when you move the weights toward the mid-point of the shaft, so you can figure out for yourself how you prefer the weight to be distributed in a paddle. Take a length of bamboo and use that as a paddle. How does this affect your acceleration and your top speed? When do you experience the greatest amount of flutter, when you're accelerating or when you're cruising? Curiosity and experimentation can teach you a lot!